An essential course for all managers. Delegates uncover the factors which make a team perform, as well as how to apply their findings back in the workplace. We’ll process your reservation and call you as soon as possible (the same day or next working day, if you submitted the form out of business hours) to finalise your requirements and confirm payment details. Please note that your booking is not confirmed until we speak to you. The course is for managers who are looking to inspire greater harmony, motivation and productivity from their people. Managers who are building new teams or dealing with changes to their teams will find it particularly useful, as well as new managers who need to consider not only their teams but how they operate as part of a leadership team. The team motivation training course investigates the factors that combine to turn groups of people into teams that can successfully work together to achieve specific tasks and goals. 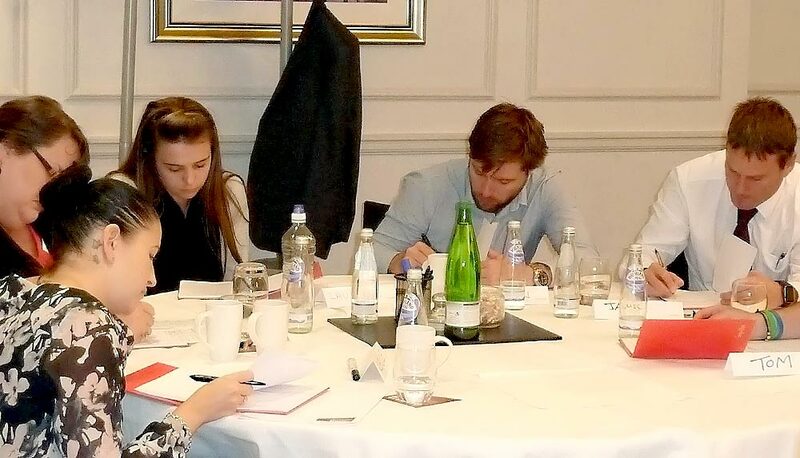 The course contains materials and is run in a way that allows delegates to examine their own team’s influences and strengths. (As with all of our open courses, there is no role play). What will delegates be able to do differently? Joining this course is easy: just call us on 0800 619 1230 now or complete the form above. Please note that any funding that’s available for this training course can be organised easily over the phone and we’ll always check an online order for funding eligibility before processing. All our venues provide excellent refreshments, a high quality hot and cold restaurant buffet lunch and a comfortable learning environment. All venues except London have free parking and all are close to major routes so they’re easy to get to. This course can optionally be taken as the core module that can lead to an ILM Level 3 Award in Leadership and Management. Call 0800 619 1230 for more information. Level 3 is for all managers and leaders who are (or aspire to be) managing people or teams. Delegates typically have diverse experience from first-time team supervisors to much more experienced managers who have no formal training or qualification. Level 3 modules may be either open courses or in-house courses. Choosing the right package gives you access to improved pricing as well as the facilities that ensure you deliver a programme which positively nails the operational and financial goals you set. Days are added to your online account and then drawn down as used. They never otherwise expire (subject to normal usage). The Enterprise Development Programmes provide many tailoring options to further accelerate performance. Prices below exclude VAT. * One delegate day is one day’s training on any course or part thereof for one delegate, or one ILM Level 2 Pack per delegate. Two delegate days could be one person on a two-day training course or two separate one-day courses, two people taking a one-day course either together or separately, or one ILM Level 3 or 5 Pack per delegate. ** Contribution required at 50% under Vision 2020 initiative. Total of £60k matched funding available to UK employers delivering leadership and management training using approved open training courses – please call for terms. Available till June 2020. The self analysis questionnaire was interesting, as usually we do not spend time thinking about our behaviour and the impact it has. I like the fish video. The trainer was very personable and delivered the course really well. Not the course you were looking for?